Asia Pacific Superyachts NZ’s managing director, Duthie Lidgard, was on hand for the 150m superyacht unloading from the yacht transport vessel at Auckland's North Wharf. 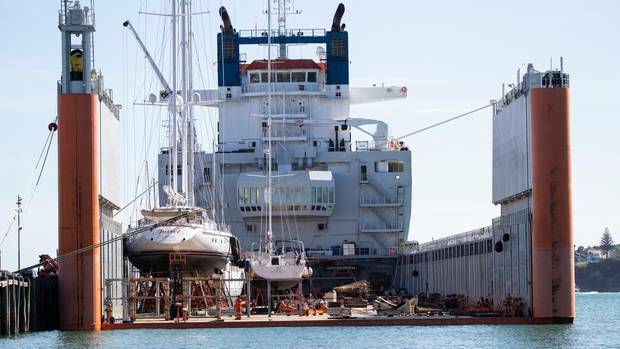 A ship transporting superyachts arrived in Auckland to drop-off and pick up vessels, including a monster 150m motor yacht, as reported by the New Zealand Herald. The DYT Yacht Transport vessel visits Auckland twice a year and docked at Wynard Quarter January 11th, off-loading about four yachts and taking on two others. Duthie Lidgard, the managing director of Asia Pacific Superyachts, a company that provides services to visiting vessels, noted the loading and unloading process was "cool" and happening now, explaining the transport vessel had a way of taking on water so the superyachts could be floated on and off. "They will lower the back door, and the whole thing will just sink right down," he said. Divers entered the water to go under the yachts and remove the wooden chocks and "cradles" that had held them in place while they were being transported. Members of the public watched as the large motor yacht was unloaded from North Wharf. "It's very big and pretty cool to set up a camera and watch it happen," Lidgard said. He also reported about 30 to 50 super yachts visited New Zealand each season - or more than half of all superyachts cruising the Pacific each year. Lidgard shared they (Asia Pacific Superyachts NZ) have had their busiest summer ever for superyachts cruising the New Zealand coastlines… and one of the hottest on record. “We feel blessed to have handled majority of the superyachts this season cruising – with the Owners or with Charter Clients”, says Duthie. “New Zealand as a whole is becoming a popular destination and not only for Superyachts, with the visiting Dock Express and pending Americas Cup in 2021, the annual seasons will only get longer and busier”.